NOTICE: "Cold" and "Hot" in these sentences express the temperature of the coils themselves. "Cold" is from -10C (14F) to 50C (122F) and "Hot" is from 50C (122F) to 100C (212F). Check that the spark occurs. Remove the ignition coils (with igniter) ( IG-6 ). Install the spark plugs to each ignition coil (with igniter), and connect the ignition coil (with igniter) connector. Disconnect the 8 injector connectors. NOTICE: To prevent gasoline from being injected from injectors during this test, crank the engine for no more than 5 - 10 seconds at time. Using a 16 mm plug wrench, install the spark plugs. Reinstall the ignition coils (with igniter) ( IG-6 ). Never use a wire brush for cleaning. Never attempt to adjust the electrode gap on used spark plug. Spark plug should be replaced every 100,000 km (60,000 miles). 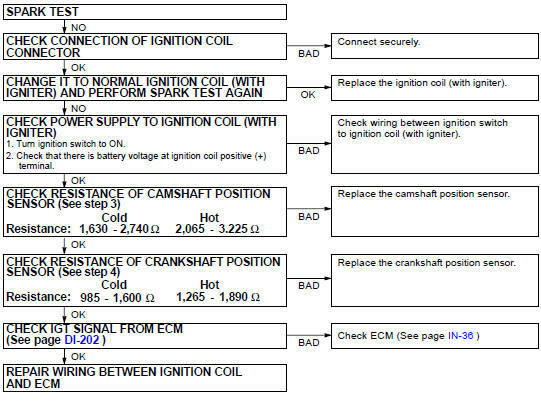 (a) Remove the ignition coils (with igniter) ( IG-6 ). Using a megger (insulation resistance meter), measure the insulation resistance. If the resistance is less than specified, proceed to step (d). HINT: If a megger is not available, the following simple method of inspection provides fairly accurate results. Quickly race the engine to 4,000 rpm 5 times. If the electrode is dry ... OK. If the electrode is wet ... Proceed to step (d). (c) Using a 16 mm plug wrench, remove the spark plugs. (d) Check the spark plug for thread damage and insulator damage. If abnormal, replace the spark plug. (e) Check the spark plug electrode gap. If the gap is greater than maximum, replace the spark plug. (f) Clean the spark plugs. HINT: If there are traces of oil, remove it with gasoline before using the spark plug cleaner. (g) Using a 16 mm plug wrench, install the spark plugs. (h) Reinstall the ignition coils (with igniter) ( IG-6 ). (a) Remove the V-bank cover. (b) Disconnect the camshaft position sensor connector. (c) Using an ohmmeter, measure the resistance between terminals. If the resistance is not as specified, replace the camshaft position sensor. (d) Reconnect the camshaft position sensor connector. (e) Reinstall the V-bank cover. (a) Remove the crankshaft position sensor ( IG-12 ). (b) Using an ohmmeter, measure the resistance between the terminals. (c) Reinstall the crankshaft position sensor.